The fishing village of Taganga, a short drive from the coastal city of Santa Marta, offers endless diving, snorkeling and beach combing opportunities. The laid-back town offers a great jumping off point for surrounding adventures, such as visits to Tayrona National Park. It might be an unusual place for a vacation, but not as odd as some Americans might think. It’s South America’s comeback kid, making the transition from the land of Marxist guerrillas and Pablo Escobar to a destination of warm beaches, dense tropics and cultural attractions in just a decade. For the adventurous and thrill seeking, it’s the ultimate trip, offering everything from jungle trekking to waterfall jumping to spectacular diving. The northern coast is one of the more popular areas to visit, with a plentiful mix of beaches, national parks, historic cities and mountains. Make Cartagena, a coastal port city, your jumping off point. It’s a mere five-hour flight from New York City. The main attraction here is the historic city center, a medieval walled town chock-full of winding stone streets, Spanish-style architecture, crumbling building facades, cathedrals and street-side vendors hawking every variety of brightly colored wares. You can grimace at the various instruments of torture in the Inquisition museum and wander through the cloister and church grounds that house the remains of St. Peter Claver, the champion of Cartagena’s slaves in the 1600s. However, without paying an entrance fee, you can easily be captivated for hours just wandering through the narrow streets, discovering countless bustling squares and strolling the city’s high, stone walls. Cap off the evening with a meal and a view at Il Balconi, located in the Gethsemane section of town. This Italian eatery has balconies encircling the restaurant and is located right above Cafe Havana, a Cuban-style bar that gets rollicking at night with a live salsa band. For any outdoor adventurer, a trip to Colombia is incomplete without a trip to La Ciudad Perdida, the more than 1,000-year-old jungle ruins of the indigenous Tayrona people. Once a high advanced commercial and political center, the city, called Teyuna, fell to Spanish conquest and left its capitol city to be reclaimed by the jungle — that is, until gold was discovered by tomb raiders. Today, the ruins remain as remote as ever and can be accessed via a four-or-five day round-trip hike. Various guiding companies will get you there, providing supplies, shelter and transportation throughout. Try Magic Tour, one of the biggest outfitters — they provide knowledgeable (although not always English-speaking) guides. Be aware, the Lost City isn’t for the faint of heart. The hike itself experiences moderate elevation gain over about 15 miles, but the trails are often extremely rough, the jungle is dense and you can expect six-to-eight hour days on foot. Depending on what time of year you go, also expect either daily rain or intense humidity, and between the nine river crossings and the weather, you can expect to never truly dry off during the course of your time there. That said, the trek takes you to see things most visitors to Colombia won’t lay eyes on. Just 10 years ago, the area was swarming with FARC guerrillas and coca-and-pot fields. However, the Colombian government sent in troops to clear out the area, destroy fields and invested massive amounts of money to rezone the areas as a tourism sector. Today, you won’t find any cocaine farmers, but you will catch glimpses of artillery-armed military patrolling the area. What’s more, you’ll get to meet the Kogi, the descendants of the Tayronas who still live in jungle villages. You’ll get to see their mud huts and take a peek into their semi-nomadic agricultural and hunting society along the way. One of the newest guiding companies is actually Kogi-operated, meaning the area’s oldest inhabitants themselves can guide you through the heart of the jungle. Find out more at http://www.laciudad perdida.com or http://www.magictour colombia.com. The northern coast is home to endless strings of beaches. 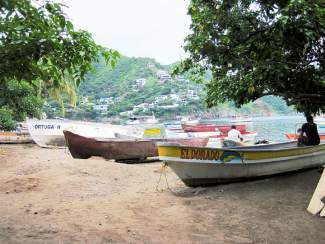 You can depart from your typical beach vacation by making camp at the fishing village of Taganga. Just a 20 minute drive from the coastal metropolis of Santa Marta, Taganga is a laid-back getaway with plenty of low-cost, comfortable places to stay and dive shops on every corner. Go snorkeling out by the corals, or enjoy ocean views at an infinite number of beachside cabana bars. The diving is excellent and reasonably priced. If you want an even more singular experience, or if you don’t have your diving license, then try your flippers at freediving. Yep, that’s diving without oxygen. Colombian national freediving champion Carlos Correa takes beginners out to learn the basics of this burgeoning sport and can have pupils descending 60 feet into the depths within one day. Find out more at http://www.elementooutdoor.com/freedive-colombia. Taganga is also a great jumping-off-point to visit Tayrona National Park. Hop a speedboat or catch a bus right to the entrance. You could spend anywhere from a single day to a full week traveling from beach to beach. You can hike or go by horse, spending the night at beach campgrounds or hammock cabanas. Americans can expect high entrance fees and sub-par food once in the park, but the secluded beaches and scenery more than make up for that in this wildlife sanctuary. And the northern coast is just the very tip of what this country has to offer, literally. Tourism is on the rise in Colombia, and in a largely positive way. It’s still off the map for many people, especially those who associate it with violence and civil war. But that’s quickly becoming the past, and Colombians are eager for the rest of the world to see that. Go see for yourself.